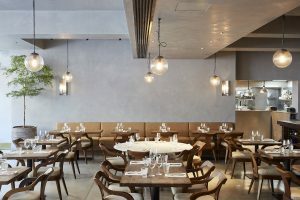 The duo behind much loved Sager + Wilde – Marcis Dzelzainis and Michael Sager – are bringing their take on the laid back fine dining experience of East London to the City. 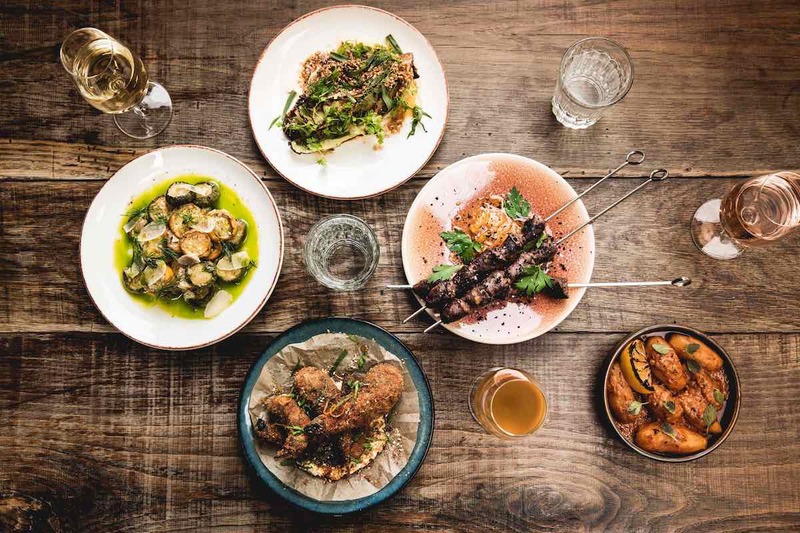 Their split-level bar, canteen and restaurant in Old Street oozes cool. The ground-level large wrap-around marble bar dominates the modern warehouse space where bartenders are smashing out cocktails on tap to busy crowds. Draft cocktails mean there is barely any wait at the bar and, as these guys are purists when it comes to drink offerings, there is no loss of quality. This is especially notable with their Nitro Espresso Martini. Here you also get a good indicator of what food is on offer in the underground restaurant. Bar snacks are leaps and bounds ahead of your typical mixed nuts, olives and crisps. Instead get around the aubergine and garlic lamachun and Istanbul-style ‘wet burger’ with sweet paprika and sour cucumber. Then head down into the main dining room to get the full effect of the modern warehouse vibes. 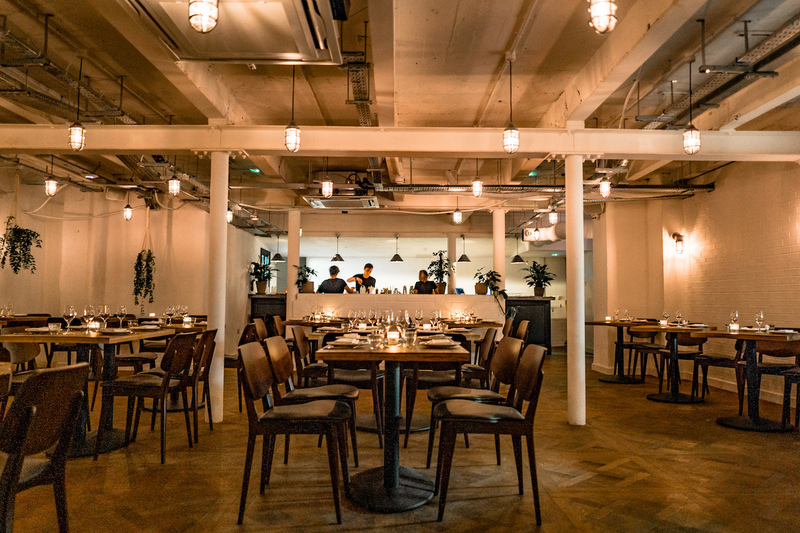 The low ceilings and dimmed lighting make for an intimate atmosphere, and because the semi-industrial space is incredibly open, you won’t be bumping into tables on the way to the loo or overhearing conversations of the group opposite. This is a rarity for eating out in London where people are often packed in tight. Now, before you get too engrossed in trying to decide what you’ll feast on, try out some of the bespoke cocktails. Dzelzainis and Sager have just finished revamping the Bassoon Bar at the Corinthia and are known around the world for their mixology stardom. And, unlike upstairs, the restaurant bartenders mix everything by hand. There’s a little more finesse here. Try the Damiana for their modern interpretation of Margarita. They’ve thrown both tequila and mezcal into this bad boy alongside fresh lemon juice and may chang essential oil. Their vodka, cardamom and rose cocktail is also quickly becoming a favourite. Then it’s time to get down to business; arranging your very own Fare feast. The menu has been carefully curated by former Ellory chef, Thomas Raymond, who flexes his culinary muscles. 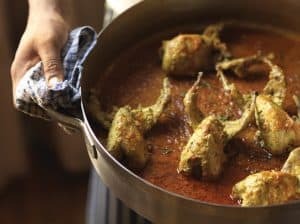 The menu offers all kinds of seasonal fusion food, mostly taking inspiration from the Mediterranean, Middle East and Britain. The smoked anchovies with pickled peppers get the taste buds fired up with the blending of sour, salty and smoky. Then tuck into some of the root vegetables which are taking over the starters for winter. The Jerusalem artichokes cooked with sage butter and capers are a massive win, while the warm beetroot salad is a surprising blend of both richness that you get from the harbourne blue cheese and a tart freshness brought into play by way of sliced grapefruit. Raymond then outdoes himself with the main dishes. The whole plaice rubbed with curry butter and topped with deep fried kale is a standout. 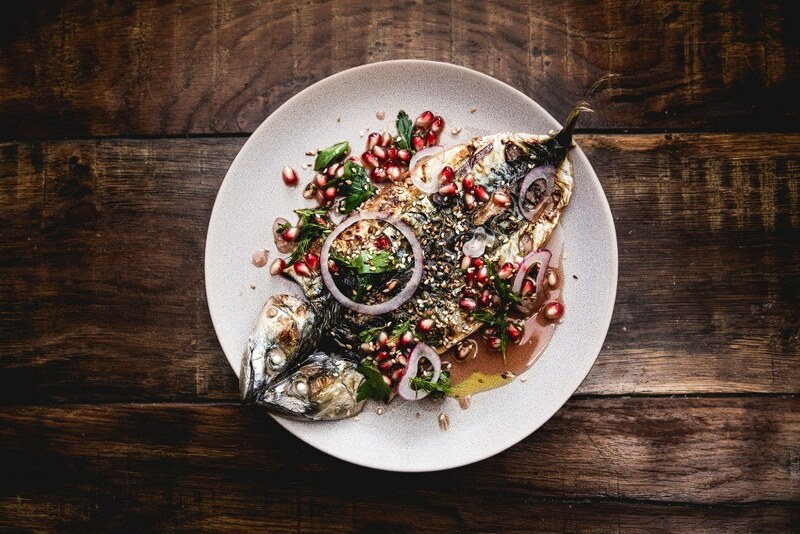 The flavours are understated, letting the fresh fish do its thing. Side salads bring in some needed colour and crunch. Red meat lovers then have two brilliant options; a beef shin ragu which is made for winter warming and the smoked lamb shoulder served with roasted and mashed courgettes and harissa. The latter is served in a large bowl with baked flat bread, so you can tear it apart and get a little messy. Each of the mains are made to be paired with wine. And Fare’s massive wine cellar, which you can peek into through some large glass windows, is bursting with choices. In fact, they’ve got an impressive 250-strong wine list of low intervention bottles from boutique winemakers. 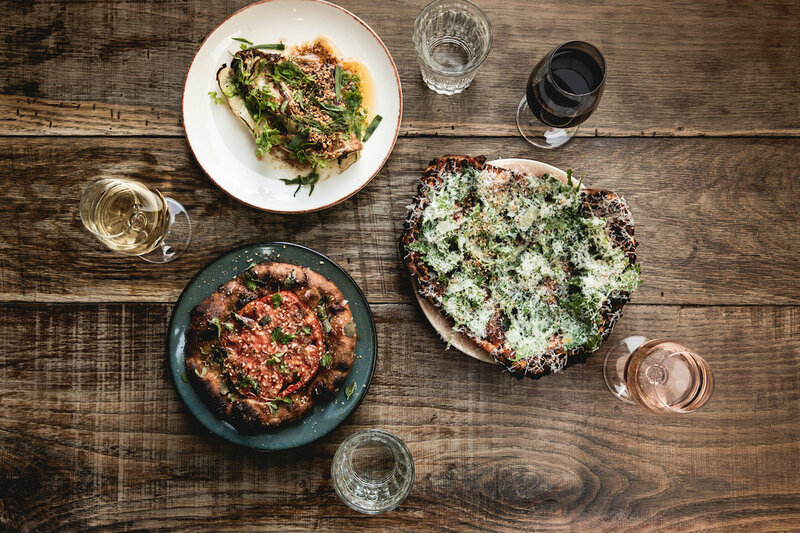 But you wouldn’t expect anything less from the founders of Sager + Wilde, which has been named one of the best wine bars in London. Talk to staff about your wine preferences and they’ll pair your food with their favourite tipple. And while they do have a lot of pricey wines, they’ve got a long list of affordable ones too. They are used to catering to both affluent and more middle of the road diners. In our opinion, there is also always room for dessert – no matter how much glorious pain you may be in from a night of feasting. The homemade doughnuts with dark chocolate ice cream may leave you a little underwhelmed after all the excitement of the mains but a bucket-sized pumpkin crème brûlée will be the perfect ending to the night. Crack through the thick burnt sugar crust, scoop up the custardy goodness and sink back into your seat. It all fares very well here.